How is Time Doctor Different from RescueTime? A number of visitors to the site have asked how Time Doctor is different compared to RescueTime, a popular and free productivity/time tracking application. On the surface, both programs do appear to be similar, but the approach and the practical applications of each product are vastly different. Both rely on a client side software package installed on a users computer to monitor computer usage coupled to a remote server that can generate reports and tracks ‘personal productivity’ – or more precisely, productive time. But this is where the similarities begin and end. RescueTime tracks computer usage silently in the background and can be configured to block websites while Time Doctor encourages users to manage their daily priorities and tracks time spent on particular tasks. RescueTime requires no effort to use once installed, whereas Time Doctor is interactive by design. Even if the application tracking in RescueTime is categorized properly – this information is very limited in its use because for the most part you cannot know what someone is really working on just from what application they are using. For example, RescueTime can track that a person was working on a Word document but just this information simply can’t tell you the actual work they were doing. So, even though RescueTime has some eye-catching graphs displaying the time worked utilizing different applications, the usefulness of the data is quite limited. Time Doctor, on the other hand, can very accurately measure how much time a person has spent working and on which tasks, which is why companies can use Time Doctor to easily generate time sheets for payroll based on the data collected. The Time Doctor system not only super accurately tracks time spent working, but it also asks users to specify which tasks they are working on, which can be viewed by managers in a variety of different reports that can be generated. This approach, based on fundamental time management principles, asks users to enter their most important daily priorities and work on them one task at a time. 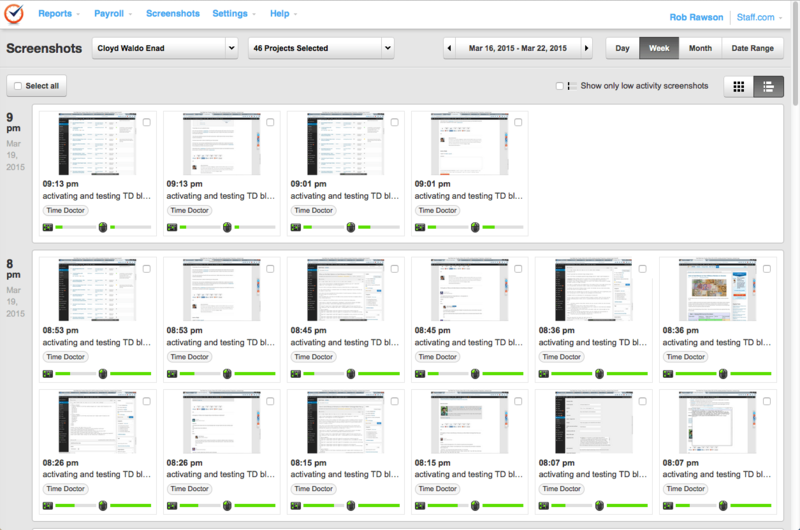 As each task is selected, the time worked is tracked for that particular task. But, how then does Time Doctor know if someone is actually working and not just cyber-slacking while they are allegedly on the job? It doesn’t. Time Doctor has a screen monitoring software that can be enabled to capture screen information that managers or an HR department can download and view at any time of the day. If a Time Doctor user says they are working on something and their screen captures reveal something different, they’ll be quickly caught out. While the idea of monitoring a worker’s screen may sound intrusive, it is important to remember that Time Doctor will only collect screen capture information during “work time”, not when workers are on a “break” or not working. Time Doctor strongly believes that business owners and managers have a right to know what their workers are actually doing during work time, but not on their personal time. We have found that, in general, if people know that they are being monitored while working, they usually don’t get sidetracked. Another important point of comparison: Time Doctor does not actually block access to distracting websites…instead it tracks the usage of “poor time use” websites like Facebook, Twitter or sports web sites for example. This information is then sent to managers in a weekly report. What we have found with this approach is that, again, people will not waste time when they know they are being monitored. Also, the practice of blocking websites can be a source of browser conflicts, problems with firewalls, spyware alerts and other issues. We’ve tried to keep our time tracking software as straight forward as possible, therefore nearly any business using any major operating system can be up and running with Time Doctor in under 10 minutes. Something else to consider is that RescueTime does provide some project tracking capabilities, but it just isn’t accurate enough to be used to track hours worked for a particular client. Time Doctor on the other hand has client and project tracking features enabling users to select and assign a client, project and billing rate to any task they are working on. Time tracking for agencies should be easy with it. Time Doctor is a business application aimed squarely at businesses or managers who want to make sure their staff and/or remote teams are actually working, and working productively. RescueTime seems to be a better match for personal users who want to know how long they spend each week using particular applications or web browsers in order to organize their time better. To summarize, the major benefit of using Time Doctor over RescueTime is that managers can accurately measure a person’s work hours while tracking their actual activities, rather than just the applications used or websites visited. To help you decide which software package is probably going to be the best match for your business, please refer to the comparison chart below…or just download and try both applications out – right now, they are both FREE to try. You quote a RescueTime user who said “It counts the time when I visited my bank web site on my break as ‘very productive’, but time in Google Chrome as ‘very distracting’, when I was actually working!” but RescueTime would normally report time by website instead of counting Chrome as one app (especially since it did detect that they were on their bank's website). I also see that this page still lists RescueTime as not having a Linux version, despite comments on this page dating back to 2010 stating that it does.I found this post because I was searching for alternatives to RescueTime, but the presence of misleading statements about the competition's product makes me lose trust in what you say about your own product. I've created a personal account, but it's showing as "Not using the desktop application". How do I switch it to desktop? I'm using Rescue time b/c I work from home and I get paid differently for my system work and for sales. Where I find it excels is for self monitoring. I work from a laptop, a convertible, desktop and when tasks demand, a MBP. In most cases it is very easy to determine my sales work from everything else. It also helps me bill for my system work. The difference I'm seeing in the two is Rescue time is great for tracking my own time to bill my employer (fill out a time card), and Time Doctor is better at a company compiling the amount of hours to bill a client. For self monitoring Rescue Time has been a great productivity tool. When I review my neutral and lower time I am often enlightened to really bad work days vs really good. One feature that makes RescueTime superior is you can track time on multiple computers. Time Doctor - you would have to pretend to be a different team member on each computer or some other hack. I guess it is because TD is dedicated to teams. But for the growing legion of telecommuters whom use one machine for this and another for that - it only gets half or less of the story unless you go back to manually correcting it. It might serve the TD crew to develop a version that synchs TD clients on whatever machines. Even classical office teams go home and work on multiple machines / devices and hense get a less than accurate picture. This partially connected to the office mode and multiple devices trend aint going away and that's where RT is ahead. It is possible to use Time Doctor on multiple computers. You do not need to pretend to be a different team member for each computer.To be sure of it being accurate it is better to click break on one computer before moving to the next computer. This something we are working on improving with the software (making it so that you do not need to click break on the first computer before starting work on the next computer). Application tracking in Rescue Time is categorized properly. How do we categorize applications in Time Doctor? The application of Rescue Time is focused around categorizing your time. In Time Doctor the tracking of applications and websites is actually just a small added feature and is not the center of the application. There is some categorization of applications, but we don't have the concept of constantly categorizing new applications (because that takes time!) That's not to say that the approach of Rescue Time is invalid, they are totally different approaches and you really have to try both to see which one works for your team. Dear friends,I installed rescue time and would also like to try time doctor - or perhaps both.However, in spite of the free download, unlike rescue time, time doctor is only free for a one month trial.I am a doctoral student for international tax law and although my perspectives of a reasonable income in the future, my budget is currently very limited.To make a long story short, my suggestion is to offer a "forever-free" version with some functions disabled (e.g. screen capture), specially for those who will use this software for productivity purposes only (I don't get better paid if I finish my thesis).Cheers and good luck! I've been using Timedoctor for one week now, and although it could be interesting I'll switch to something else. The main reason is the poor interface of the main window : it's very cumbersome to specify a project for a task. If the time saving app takes me more time, it does not work for me. Some of the facts you state about Rescuetime might be true for the free version, but definitely not for the paid version.1: You can track single documents, so I know perfectly well which Word document I'm working on, and I can even assign that to a project. 2: You can specify time for projects for each 5 min interval, so yes, there is more interaction. 3: it's very easy to set the level of any website/application to the desired level, so there's some interaction too. 4: You can add off-computer time, and it tracks when you're not active (after which time can be logged as well).I'm not giving a value judgement here, but the things you state about rescuetime are simply incorrect. I'm both a Rescue Time and Time Doctor user. I find them each valuable and can be used in tandem which I do.Rescue Time runs in the background. I can do a quick analysis of my overall computer activity. I like to check it about twice per month. It provides me a great overview where I spend most my computer time.Time Doctor is interactive. I use it as a daily tool to make sure I am being productive. It enables me to stay focused in order to complete a specific task. The reports I receive are really dynamic even to track time I work for a specific client in order to bill them accordingly. In the past time has gotten lost in the mix when I'm working on multiple projects at once. This applies to my team as well. I can see what tasks they have completed and when they are working. Really helps me prepare follow up meetings and not micro manage.Hope this helps! Hi Mark, we've updated our table in the blog post above. Thanks for the reply. We realize it's a bit cheeky for us to do a comparison with Rescue Time when you guys are much more established, fully developed and we are really just starting up. And we also do like Rescue Time and think it has advantages for some companies.Available for Linux - will correct it on the chart aboveTracks specifically poor time use websites, will correct it in the chart. We think it's easier to have a list of poor time use sites that are already pre-set so that the administrator doesn't need to do any work, but both methods seem ok, and Time Doctor is still under development so it will be significantly improved in the near term future.Tracks time spent on separate tasks - We don't think tracking tasks via the applications and websites that you visit as per Rescue time is really possible. For example right now I am typing on a text editor which is titled "Untitled". How could Rescue time possibly track this time accurately? A text editor called "untitled" could signify any number of tasks. It's impossible to know what it really is. The fact that Rescue Time is silent is an advantage and a disadvantage. The fact that it does not require data entry makes it very easy to use, as the user has nothing to do. The Time Doctor team realize this is the advantage of Rescue Time over Time Doctor, however, it's also a disadvantage as it does not allow you to track time accurately and does not allow you to track tasks for example.Ability to see what your team is working on, Daily productivity score and manually add hours - Will remove this from the comparison, it depends on your definition of how these things should work, there are several reasons why we think it works better with Time Doctor, but these are not really important points. "Time tracking is accurate enough to pay from the hours in the software" - We totally disagree that Rescue Time is better for tracking the actual hours that a person works for several reasons. Rescue Time works in the background all the time whilst the computer is on. The person is not always working when using their computer so it is necessary for the person to say when they are working or not. It's not possible to know from the websites visited or applications used if they are working or not. It's also important to track time spent away from the computer. Rescue Time has a feature to track time off the computer but it's not comprehensive enough to track time accurately. 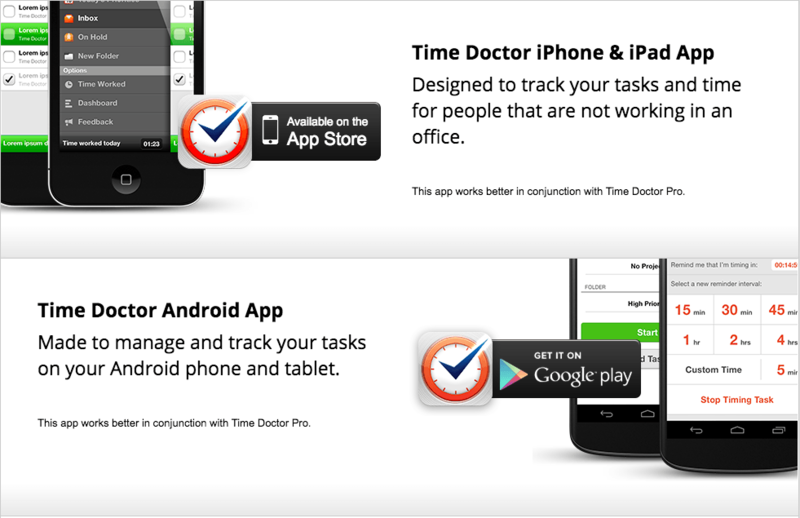 Time Doctor is set up to track accurately the tasks that a person is working on with their definition of each task. It's not true that software can know more accurately than humans if the person is working or not. The computer program simply does not know if the person is working. So the statement that "humans make more errors" is not relevant as the computer in this case is constantly making errors, it never knows what the person is "really" doing, it just knows if they are using a program or a web site. Also Time Doctor does track the software and web sites used and generates reports based on this data (this feature is about to launch), however this data is not something that can be used to pay a person. You need instead toOverall we acknowledge that Rescue Time is better for some companies, basically if they want a silent system that does not require data entry. However we believe that Time Doctor is far more comprehensive in helping the person to be more effective because it attacks productivity from multiple angles for example helping the person to list their most important tasks for the day and coaxing them to work on these important tasks and not get distracted with less important tasks. Thanks for this thoughtful comparison. I do feel like I should clarify a couple of things in the interest of accuracy, because it seems there is confusion here:"Available for Linux": RescueTime has a community developed client for Linux users that offers almost all the features of the official client. This is referred to on the site. "24/7 Support": I'm not sure what you mean by this, but RescueTime support responds when they are awake, and is scattered across time zones for better coverage. "Time tracking is accurate enough to pay...hours in the software": If your app does not use automatic tracking for software use, I can see how it could be *more* accurate. Humans make more errors. "Tracks time spent on separate tasks": Not sure how you arrive at "no" for RescueTime. You can accomplish with key word searches, or the project tool. "Tracks specifically 'poor time use websites'...": "No" is wrong here. This is explicitly a feature of RescueTime. You can be emailed or alerted with a popup when distracting time exceeds a certain amount, which is triggered by distracting websites. The administrator can adjust what sites are considered "poor time use". "Ability to see what your team is working on...": "No" is wrong here. This is the principle feature of the team version. "Daily productive score...": "No" is not correct here. This a key feature of RescueTime's productivity by day report. 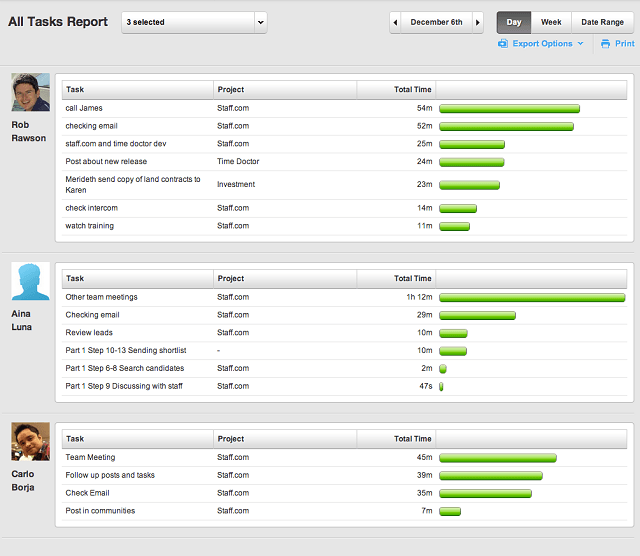 "Can manually add hours": RescueTime users can do this with the projects feature. "Nudges for periods of inactive...": RescueTime offline time tracking would accomplish this.I hope you let this post stand, for reasons of accuracy, or correct the above chart. Thanks!